THC infused and oh so fizzy. Our THC infused bath bombs are the bomb! For the ultimate in relaxation, take a soak with these fizzy devils. They give a calming effect that we have a hard time describing any other way than “noodly.” Our cannabinoid oils actually integrate with bath water rather than simply floating on top, and they won’t stain you or your tub. Will it make me feel high? Nope. 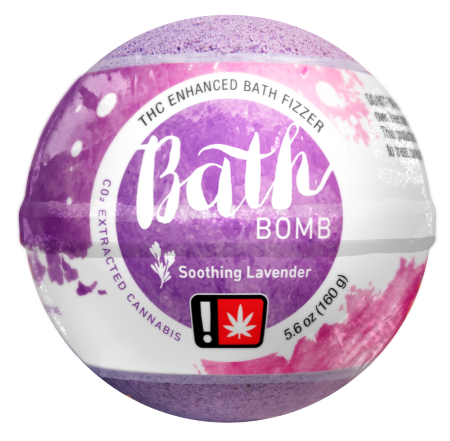 As with other topicals like lotions, our bath bombs are not psychoactive. They simply make you feel relaxed and make your skin feel luxurious. Soak as long as you like or until you go full prune mode. Do I have to worry about the color staining me or my tub? Our bath bombs are formulated to lend color to your bath water without staining your tub or coloring your soon to be soft skin.